OK so you’re raring to go after taking a break after 9. The long tee on this par 4, 167 metre hole is actually in the corner of a cow pasture but don’t worry — the cattle are fenced out! 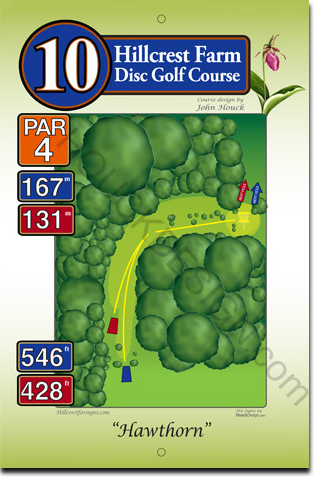 You’ll love this shot down a steep slope to meet the fairway as it follows a gentle downhill grade. Then the fairway turns sharply right to the basket near the hawthorn tree.